"The officers had no chance whatsoever," the sheriff said. The man suspected of shooting seven law enforcement officers, one fatally, earlier this month was in possession of 129 firearms and opened fire with three of them, including "two military-style assault rifles," Sheriff Leon Lott of Richland County, South Carolina, said at a news conference Tuesday. "This was a planned ambush," he said of the Oct. 3 attack outside Florence, South Carolina, that took the life 52-year-old officer Terrence Carraway. "We're fortunate that more officers weren't killed." Lott said two of the injured remained in critical condition; one was said to be improving; and another was transferred to a medical facility in Georgia. "We still have four police officers in the hospital," he said. " … They need your prayers. 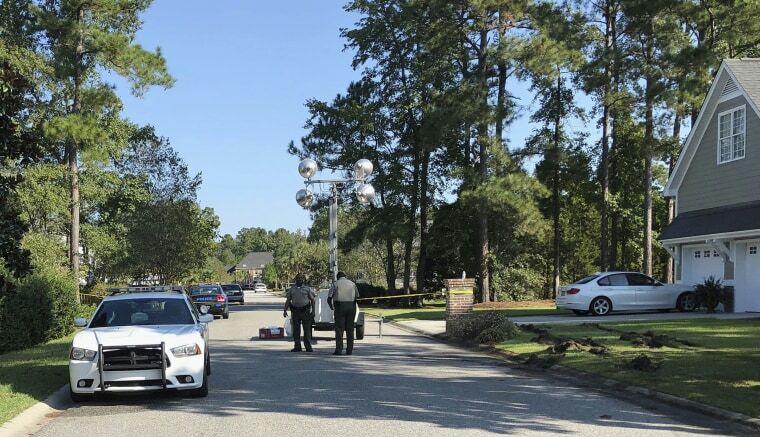 The violence unfolded after authorities arrived at the home of suspected shooter Frederick Hopkins, 74, to serve a search warrant alleging that his son, Seth Hopkins, engaged in criminal sexual conduct with a minor. Arriving law enforcement officers were met with gunfire and plans to storm the multi-generational home were complicated by the presence of four foster children, roughly ages 10 through 17, hiding inside, authorities said. The sheriff's department said in a statement Tuesday that more than 390 shell casings were found outside Hopkins' residence; at least 39 were found inside. "Just going inside that house is chilling," Lott said. " ... To go there and see what these officers were facing is something that I never want to see again." He said the crime scene at the home is now processed and evidence would be sent to prosecutors. The elder Hopkins faces one count of murder and six counts of attempted murder. NBC News affiliate WMBF of Myrtle Beach, South Carolina, reported that Hopkins' request for a public defender was denied Tuesday by a local judge.